Now, this photo is a close-up (and it exposes Bruce’s purchase of double-stuffed Oreo cookies for his writer’s club! ), so I will help put it in perspective. This plastic is in a box that is 14″ x 21″ x 6.5″ (roughly) and the plastic is about 13″ high. If you stuff the plastic in the box, you can, of course, compress it to fit in the box. But, that is hardly a comfort to me. My conclusion: too much plastic! I have begun compiling a list of the companies that manufacture these products. So far, I am up to 21 companies. I am creating a form letter to be sent via e-mail or US mail or the company’s website requesting that they examine their packaging. It will be nearly identical to the letter I posted on my blog before, but this version will have additional data, e.g., the quantity of the product that I consumed in a month as well as the specific product name. When I first started this project and looked into alternatives, you’ll recall that I located the company, TerraCycle, and discovered that they have a zero separation box that is 12″ x 12″ x 12″ and will cost $48.02. After my discovery, I contacted the company to verify that this was my only option. Even though their website states, “We will respond to any customer service inquiry within 24 hours,” I have not yet heard from them. I will contact them again tonight to see what happens. 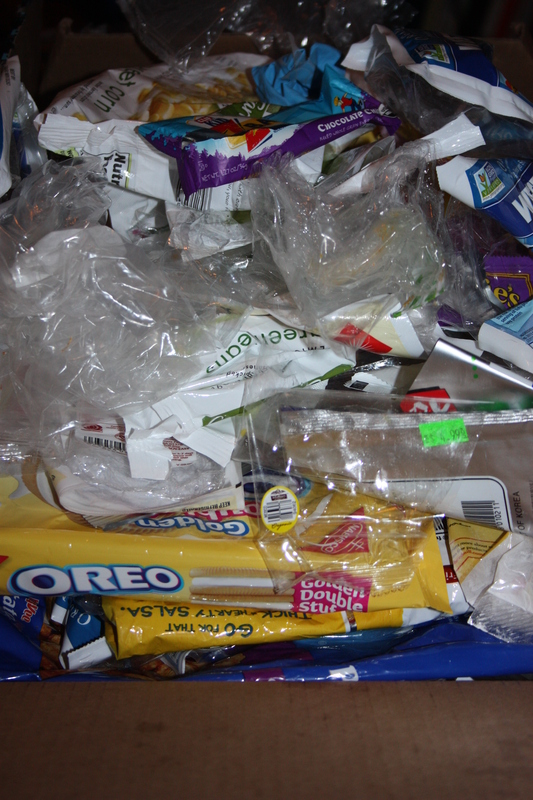 Here are some of the things I have noticed so far: most of the plastic packaging is not labeled as recyclable. A limited few have #4 plastic packaging which, I have recently (read MINUTES AGO) discovered, is recyclable at the local Wal-Mart even though it is not accepted by my curbside collection. How did I learn this? There’s a great interactive map on Earth911.com that helps you search by zip code for plastic bags #1 through #7. Stahlbush Farms: This company offers all organic produce and ALSO bags that are made of a fully recyclable paper. AWESOME! I will try to think of others. Right now, though, I am leaving because I heard that women’s moguls are on. Gotta dash! A trash free world? Dreamy! I have been collecting my plastic bags, wraps, containers, etc. in the hope of sending them to TerraCycle. But, I confess myself disappointed. I have done some further investigation into brigades, and it does not seem like a good fit for our household. For example, there are brigades for snack bags. One of them is for Frito-Lay products; another is for the Hain Celestial Group (makers of Garden of Eatin’, Bearitos and Terra Chips). In order to have our household use this option, we would have to buy either Frito-Lay or Hain products exclusively and collect them over time. Similarly, we would have to use only Tom’s of Maine products for our tooth care, and only CLIF energy bars and so on. In other words, these brigades are not meant for reduction of individual household waste. They are meant for people who want to reduce waste and want to expend the effort to encourage their community as a whole to reduce their waste for a period of time (kind of like a holiday food drive). There are other options with TerraCycle. For example, you can purchase what’s known as a “No Separation–Zero Waste” box. This allows you to include any and all waste items (shoes, markers, toilet brushes, toothbrushes, old clothes, etc.) into one box and ship it to TerraCycle to sort and repurpose for a profit. For a 12″ x 12″ x 12″ box, you will pay $48. As a consumer who averages out-of-pocket trash costs about $15.00 per year (10 bags of trash at $1.50/bag), I am not particularly excited about this. As a consumer who would like to see our country markedly reduce our trash habit, I feel this is a first step into a better world. But, like most nascent undertakings, I think some refinement is in order. You take a walk around a community garden. All of the raised beds are made of a recycled material from your community. The garden paths are wood chips from downed trees after a recent storm. A quick tour of the back yards is completely free of old tires, tin buckets and broken plastic swimming pools. You take a train ride and see sloping banks of grass and wildflowers. The moldy mattresses and fractured plastic lawn chairs that used to litter the area are gone. Man-made hills that used to have bellies full of waste have been gutted and the resources within harvested to provide materials for manufacturers of all kinds of goods. It’s just a glimpse, right? But, dreams often start with scattered images before the whole story unfurls. Tonight, I will dream. Tomorrow, I will start writing more letters. Tonight, in class, one of my students asked, “Are you a cyclist?” I hesitated and thought, “Well, I like to do triathlons, but I didn’t do any last year even though my goal was to complete 3….but, then I had that ankle injury that I was worried about…which turned out to be a result of aging….” Then, I said, “No. Why?” “Oh,” he said. “I just noticed your water bottle.” I looked at my Camelbak and said, “Well, I do use this on my bike, but no, I’m not a cyclist. I’m just very passionate about toting my own water around with me wherever I go.” I think I mentioned something about reducing trash and supporting water treatment facilities. Then, this student commented about how he had been to the Red Sea and how the beaches were beautiful, but how there is so much floating plastic, it’s disgusting. Then, he told me that there are now trash boats that pick up waste in the ocean. I found the link to something called the Blue Whale boat and am sharing it with you. It’s late. I’m tired. That’s the little nugget I’m going to share with you today. So, here I was typing letters to companies to tell them to please use recyclable packaging in their products when, lo! I come across TerraCycle’s site! I am familiar with TerraCycle. My husband and I used to purchase a lot of Bear Naked granola (click the link to find out our favorite flavor) and I read the package and learned about TerraCycle. But, at the time, and don’t ask me why, I was under the impression that TerraCycle had limited recycling capabilities or was mostly only affiliated with Bear Naked. Who knows? But, now? Exciting! There are “brigades” for all kinds of products: cell phones, cigarettes, snack bag brigades…the list goes on! Now, it seems, I have a new project on my hands! I will continue to write letters, of course, since the more we can reduce plastic being used in consumer products, the less we have to worry about that plastic going to waste. In other news, I decided to buy a Vita-Mix flour container on amazon.com this week. Since our house is largely gluten-free, I will be buying grains in bulk at our local health food store and then making the flours myself. While Bob’s Red Mill is very convenient, it is very expensive. And, guess what? You can’t recycle those plastic bags either! Looks like there will have to be a new “brigade”! On a cold, snowy day, it would seem that there were lots of chances for me to work on my letters to my senators and to companies to encourage waste reduction and the use of recyclable plastics (preferably #1, #2, #5 and #7 as I’ve mentioned before). While I made progress (both letters to the senators were sent! ), I admit that it was not as incredible as it could’ve been. I spent much of the day reading The Minor Adjustment Beauty Salon by Alexander McCall Smith aloud to Bruce and Philip. I love this book series and so do they. Every time I read a new installment, I feel warm and full of hope, eager to have red bush tea with Mma Ramotswe. The sentiments expressed by Precious Ramotswe, if felt by more people, would definitely contribute to the improvement of our planet. Luckily, many people read the series and, I’m sure love her for the same reasons, so the seed has been planted. Incidentally, you can go to Botswana and take a No. 1 Ladies’ Detective Agency tour! While Philip and I were watching Singin’ in the Rain this afternoon, I read a bit of Food Politics by Marion Nestle. The book discusses reasons why Americans are so confused about what to eat and explores the role of food production companies extensively. I am now reading the chapter about marketing to underage children, the rise in obesity that correlates with the increase in food and non-food (my term for snack foods and foods high in added fats and sugars) consumption. In earlier chapters, she discusses the “soft” and “hard” tactics food companies use to influence legislators and regulators. When you read the book, it will challenge you to think about the food you eat. An improvement to our current food system, in which grains are largely fed to animals, and most foods that are consumed are processed, would certainly benefit the world at large. I have been a consumer of <product name> for many years. I visited the EPA’s website recently and learned that, in 2011, Americans generate more than 250 million tons of trash each year. In addition, the amount of waste generated is increasing ever year. I do not want to be part of that large contribution to the landfill, but, in buying your product, I am adding to the waste. This is because <your packaging/product/other> is not recyclable. I am writing to urge you to utilize recyclable or eco-friendly packaging for your products so that consumers don’t have to harm the environment after they are finished enjoying your product. In my municipality, the following types of plastics are accepted for recycling: <list types of plastics>. Perhaps, when you pursue this option, you can look into one of these grades of plastic if an available eco-friendly alternative is not a viable solution. In many cases, I use e-mail to send my messages. But, in some instances, if I am sending plastic back with the letter, I will, of course, send it via US mail. I will post highlights of responses from companies as I receive them. That’s all for now. I will sign off and will hope to stay warm tomorrow while the temperature drops to -20 degrees F. A good day to finish those letters to send off on Monday! A goal of mine this year is to minimize the amount of waste my family and I generate. According to the EPA, “In 2011, Americans generated about 250 million tons of trash.” I can’t even really visualize what that means, but this video about trash, featuring Dr. William Rathje (now deceased) of the University of Arizona, gives a slight picture. I am convinced that we could do so much good on this planet, if we were able to adopt nearly universal cradle-to-cradle business practices. That is to say, businesses should design products that are designed for disassembly and for recycling. I don’t like the idea that the bag that contains my breakfast cereal has to be thrown into the trash. I am not convinced that just because we don’t generate as much trash as our neighbors (a conclusion drawn from the weekly presence of their trash bags and the quarterly presence of ours), that this is OK. While I would love a world with ZERO trash, I will settle for a drastic reduction of trash over a short period of time. During World War II, The United States impelled people to recycle “for the boys.” What would it take to motivate American citizens to this level of community spirit today to recycle? Probably some type of tax incentive and some type of national program to facilitate it. For what it’s worth, I will send a letter to my elected officials and suggest it. Sure, it’ll get a laugh. But, at least I will have done something. 1) I will write a letter to the companies that do not have recyclable packaging and request that they change their packaging. 2) I will explore the possibility of purchasing an alternative. In 2010, Nature’s Path posted a press release about its recyclable packaging. Interestingly enough, their “Eco-Pac” usage doesn’t seem to extend to their entire product mix. I know for a fact that the liner in Gorilla Munch is NOT recyclable. I guess they’ll get a letter, too. 3) I will make my own granola. Then, I will do myself a favor (maybe) and eat a little less sugar in each bowl. So, hooray for me. Big plans. But, what did I do to eliminate trash today? I received shipment of my organic/muslin produce bags from amazon.com. That will reduce my reliance on plastic at the checkout and will probably irk the clerk as s/he tries to a) subtract the tare weight from each bag and b) determine the contents within since they are slightly opaque. But hey, I’m doing this for Mother Earth and you get to chat with a nice person for another extra minute today! I also received shipment of my biodegradable trash bags from amazon.com. While I feel a bit better about this product than I do conventional trash bags, I am still not happy with having to put trash in a landfill. Of course, I could be like my neighbors and burn my trash. But, I have a problem with dioxins, so that is just idle chatter. I am half tempted to do a month-long experiment, though, and start putting all non-recyclable plastic in a box and see what accrues. And may this next week’s bag of trash be my last!